For many years, the only type of sinks that were available were the drop-in sink that sit on top of the counter where it is installed. When this was the only choice, it didn’t seem to make that big of a difference, probably because we didn’t really know any better. Having a drop in sink creates a raised lip that can be annoying when you are trying to wipe off the counter and the crumbs and other foreign matter gets stuck on the lip and won’t go into the bowl of the sink. With an undermount sink, this isn’t a problem. 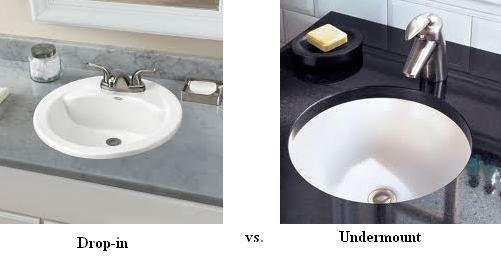 Undermount sinks are sometimes called “under counter” sinks which describes exactly what it is: a sink that goes under the counter. When installing the sink, instead of putting it in from the top, or “dropping” it in, the sink is brought in from underneath the counter an mounted to the bottom of the counter instead of being on top of it. This eliminates the lip problem that comes with a the regular drop-in type sinks. You may be thinking, how does this work? Isn’t it the lip of the sink that holds it in place? With an undermount type sink, there are anchors and screws included to make it possible to keep it in place. Depending on what sink you are installing, there can be different ways these anchors are set up. Before putting the sink in its place and tightening the anchors, beads of silicone adhesive are applied to the top rim of the sink itself to give it added strength to hold on. Once the bowl is in place, the anchors are tightened and the bowl will be suspended where it needs to be. From the top of the counter, any excess silicone is removed and the sink seems to blend with the counter instead of sitting on top of it. Many different companies manufacture sinks, but when I am looking for a good product for a good price, I buy an American Standard undermount sink. They are built to last and are easy to install. The instructions come with a template that makes it easy to know where to cut the countertop so that the bowl of the sink lines up perfectly. Not only do they make bathroom sinks, they have a number of kitchen sinks available too. I have one installed in my kitchen and it is one of the best kitchen sinks that I have dealt with. It also makes it easy to wipe the counters off after dinner is over and the dishes have been cleaned up. If you are remodeling, building a new house, or trying to just update your kitchen or bathroom, consider getting an undermount sink! They give extra character to the room in which they are installed and they make your day to day jobs easier to do. The different types of products that are available make it easy for you to have the custom look that you may be looking for to give your room that extra flare!